CURIOUS LITTLE BIRD: Would You Like To Sponsor Curious Little Bird? Would You Like To Sponsor Curious Little Bird? I love promoting shops, blogs, and websites that I enjoy and am happy to accept sponsors who click with my and my readers interests! As a beginning blogger, I’m offering free sponsorship to other blogs or independent shops, all I ask is that we do a button swap, just email me at shop [at] curiouslittlebird [dot] ca. Buttons must be 190 x 190 for the large size, or 190 x 90 for the small size! 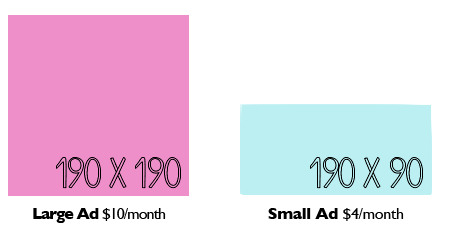 Below is my advertising options if you would prefer to pay for your ad. ♥ Giveaways: Giveaways generate a lot of extra traffic and are one of the best ways to get noticed. If you have something you’d like to offer up for giveaway, please email me to discuss.